Puppies that are left alone in the yard are invariably going to learn digging. Digging is a natural instinct for dogs-they find this a fun activity and many even want to create a den like structure which makes them feel safe and secure. A bored, untrained puppy is going to soon start digging. If you are around when your puppy first tries it, you can redirect her/his attention. This way, no bad habits will set in and you will have a hole-free yard. 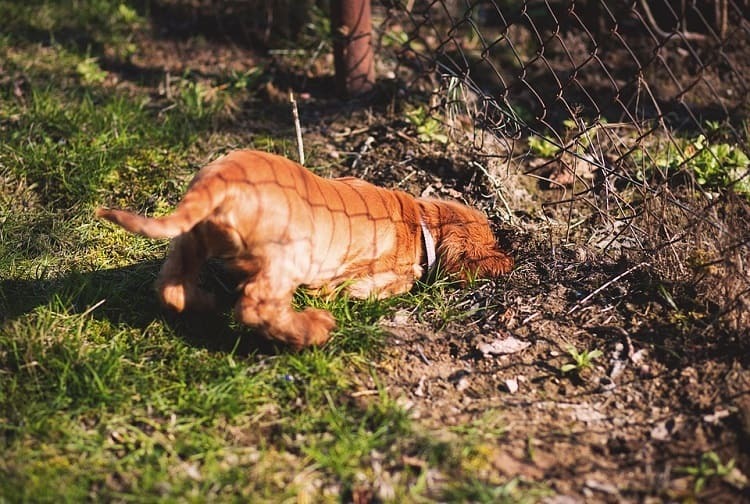 There are many dog digging deterrents including toys, games or showing the puppy a designated area where it is okay to dig. You can even make a loud noise such as clashing two pots as soon as you see him dig. This input is critical and will teach your pet rules of the yard. Most dogs take to digging holes in the yard when they are looking for cool, shaded areas to use as a den. Digging a hole is a natural way your puppy will cool itself in the hot summer months. This behavior stems from natural instinct. So it is important to provide cool, shaded areas for your pet especially in the warmer months. If your dog is usually outside, bringing him inside and provide air conditioning or run a fan. You can set up an umbrella or place a dog house in the yard. If your pet loves water, you can provide a splash pool or kiddie pool with an umbrella. Some dogs dig out of boredom. So a great remedy to stop your dog from digging holes or digging under the fence is to take him for long walks. This way, your pet can burn off the extra energy and you will be left with a hole-free yard. Never let your dog off leash while walking him. If your dog still won’t stop digging under the fence, you might want to fill up the hole with concrete. Alternatively, add a ¼ inch mesh wire along the fence line which will make it impossible to dig through. Most dogs give up once they hit something hard and won’t dig deeper. Burying sandpaper in the areas your dog usually digs in is another easy way to stop dog from digging holes. The rough texture is annoying to your pet’s paws. However, this method may not be foolproof and your dog might find another spot to dig in. To avoid this, you will have to bury sandpaper in several places until your dog starts to think it is everywhere and stops digging permanently. Some commands like ‘Leave it or Stop it’ can come in very handy when you want your dog to stop digging holes or under the fence. Obedience training is easy but you need to be patient and consistent and also start the training while your dog is still a puppy. You can also create a doggie-dig area in your yard–a pit filled with sand. This will be great for your pet but you need to keep it clean and ensure that no cats or stray animals use it as a litter area. For small breeds, this digging area can be 4×4 and for larger breeds it could go to 8×8. To teach your pet that s/he may use the area for digging, you can bury toys, treats or other treasures for your pet to dig out. Periodically, change the treats that you hide and remove the older ones.Chew toys, kong toys and marrow bones are some good treasures to hide. Bury some of your dog’s poop in each hole he has dug. 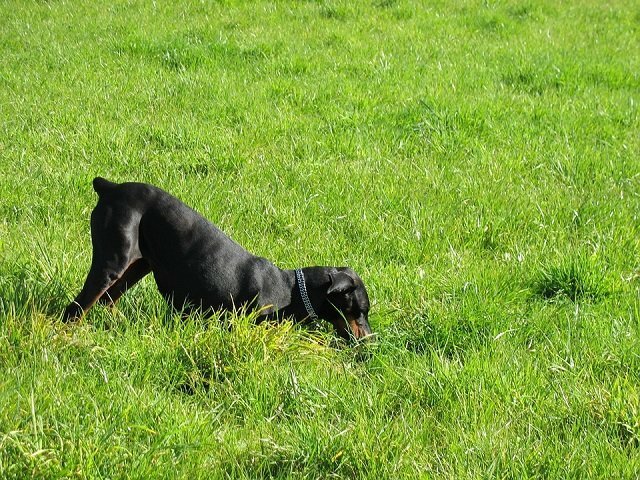 When your dog smells the poop, he will mistakenly think that he has uncovered something he had already buried before. This way, he will be more inclined to leave that spot alone. Some dog breeds are born diggers and most of the above methods and easy ways will help you prevent this unwanted behavior. However, if your dog continues to dig despite trying these ways, s/he could have some underlying problem. Boredom, frustration, and pent up energy are some of the reasons behind excess digging. Try signing up your pet for some fun agility training or dog obedience classes. If the behavior persists, speak to your vet. To certain extent, dog digging is instinctual behavior but in excess, it signifies a deeper issue. Never punish your dog for it-instead, try to find out what it is lacking and to alleviate its boredom. Be creative and provide lots of activities for your pet. You will need to experiment and see what works for your dog. Very soon you will be seeing fewer holes in your yard.